I approached this book with a certain amount of guilt. Did the Western Region of British Railways, the nationalised organisation that in many ways clung manfully onto so much of the GWR culture actually conspire to bring about the closure of the Somerset and Dorset Joint Railway? Did the WR overlords make the final timetables so deliberately useless for travelling anywhere meaningful on the much beloved line that closure was inevitable? Why did they not dieselise and see if that made a difference? Was it a lingering bit of handed down GWR competitiveness that gained vicarious pleasure from conquering the Midland at last? Was it actually our fault? And should we apologise? That’s probably going a bit far but we do tend to glamorise the GWR even while know in our heads if not our hearts that, as a private company it did indulge in some pretty unsavoury competitive behaviour to protect its shareholders’ interests. 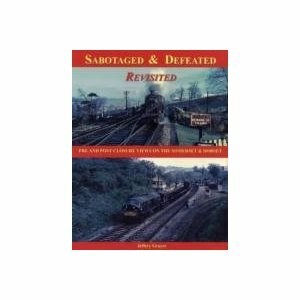 This book is actually pretty damning about the role of Swindon in killing off the S&D and maybe the author is right. It certainly was a wonderful line with its fabulous scenery and interesting practice, long double headed trains heading over the Mendips with a host of fascinating locos, some venerable and some modern. But by 1966 it must have looked to the ascendant modernisers like an antiquity and anyway, who wanted to go from Bath to Bournemouth the slow way, however scenic? This book, an updated version of 2 previous volumes, takes us through the last sad years of the S&D and there are miserable scenes and stories of dirty and neglected locos on their last legs, RCTS DMU trains, Hymeks on demolition duty, then dismal views of ripped up track, dereliction everywhere. Then just when you finally feel suicidal at what we did to it, there are some happier glimpses of the resurrected snippets of the railway at places like Midsomer Norton and Shillingstone. It is a fascinating book and as a historical record it is important but we are romantics, aren’t we? and there is about it an almost unremitting lingering sadness about the fate of the S&D that pulls at your heart strings and no Sustrans cycle path plans will ever do anything assuage. Back to the world of dreams, as Basil Fawlty once said, bitterly. Please note, though, that at the beginning of Feb 2013, it is out of print at Amazon and copies are hard to track down. Mine was a birthday present.